If you are looking for psychometric tests online then you have come to the right page. PeopleMaps pioneered online psychometrics as far back as 2000. We are specifically talking about personality tests here. Although Psychometric tests also include numeracy and literacy, will not include them in this page. For many years the psychometrics industry fought against moving online, claiming that it would not work and that the results would be inferior. We saw this same approach from the music industry as they tried to stand against online music downloads. However Apple came along with iTunes and showed the industry how to do it online. PeopleMaps was also the pioneer of online psychometric testing and is the only system built from the ground up for an online audience. PeopleMaps never had a paper based system. Many of the psychometric tests were originally designed as paper based tests. This means they contain lots of questions and take about forty minutes to complete. A real online test, will have a short questionnaire, taking less than ten minutes. Your results will be delivered instantly online. Many providers who claim to be online will have you wait about till they email you an attachment. That’s not an online psychometric test, that’s old school email attachment with huge delays. Again old paper based systems that dragged themselves online tend to have very poor user interfaces. A proper online psychometric test will provide you with a very easy to use, intuitive interface. There are a lot of costs cut when properly done online, so you should be paying a lot less for quality psychometric reports. Make sure you are paying internet prices not consultants prices. PeopleMaps provides a range of personality tests for individuals and for businesses. The Career Test is very popular with job seekers. If you want to know the answer to “what job should I do?” then check out this link too. The business applications include psychometric tests for recruitment. 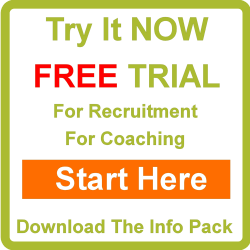 This online application has been specifically designed for recruiting people and provides the interviewer with a psychometric report that includes guidance on what to ask the candidate and what to look for in the answers. The Psychometric Test application for Managers is designed to help each manager get more from their staff members by helping them understand what makes them tick. PeopleMaps is a Jungian system. It was developed by a leading UK business psychologist and is based on the research of Carl Jung. Jung is often referred to as the father of personality profiling and is credited with terms such as extravert. Many other Psychometric Tests Online are also based on the research of Carl Jung. 1) It has the shortest questionnaire of all the professional systems available to date. 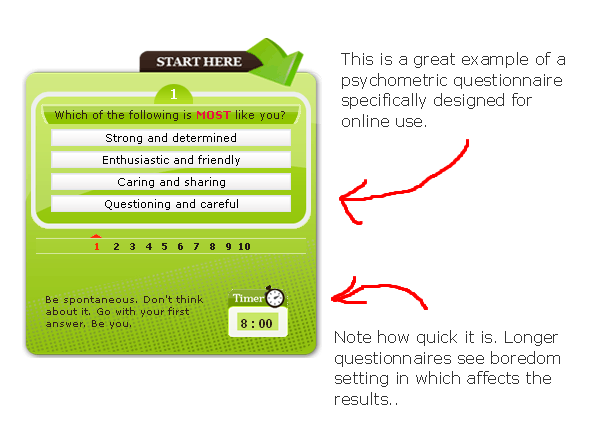 The questionnaire takes either 3 minutes or 8 minutes depending on which version you are using. This is compared to 30 to 40 minutes for other systems. Despite being such a short questionnaire, it is extremely accurate and is indeed capable of a higher resolution than most other Psychometric Tests Online. 2) Another unique feature is the access to instant results. Both the consumer and the business applications deliver instant results. No waiting about on emails. 3) The PeopleMaps reports are written in plain English. No consultants required to interpret the jargon. The reports are designed that anyone can print them off, walk into an interview and conduct the most meaningful interview of their life. This has been an article about psychometric tests online.